Ghosts N’ Goblins is one of the classics that is often imitated these days. It isn’t hard to see why, as it’s pretty much a winning formula. A hero that can only take two points of damage before dying, must go on an action platforming adventure of quarter-munching proportions. Some of these games simply take that essence, and try to provide a carbon copy. Others take the idea, and try to build upon it. PROS: The brutal, unforgiving, and yet somehow addictive fun you love. CONS: Bugs, minor collision detection issues. Inconsistencies. GHOST PUPPIES: May haunt your dreams, but they can also help you. Battle Princess Madelyn is one such game. It uses the combat of Capcom’s classic series as a foundation, and puts a large skyscraper of ideas upon it. For the most part it works because it does something substantial. It has not one, but two campaigns to play through. The first of which combines the tried, and true combat with adventure game, and JRPG conventions. The primary campaign is a Story mode. It opens with a little girl named Madelyn lying in bed playing a Minecraft clone on her tablet. Her Grandfather comes in, and in true The Princess Bride fashion proceeds to read her a bedtime story. He tells her the tale of a warrior, coincidentally also named Madelyn in a European kingdom in what is presumably during the Medieval period. This Madelyn has a tiny lap dog named Fritzy. With the castle overrun by monsters, the little canine sacrifices his life to save the Royal Guard. After some dialogue with her Grandfather, it turns out that Fritzy’s soul isn’t content to go to the afterlife just yet. As a spirit, he decides to follow Madelyn into glorious battle. Over the course of the game Fritzy goes from being a merely cute avatar that follows you around, to being a very useful back up character that will help you immensely. While the initial area looks like it will be another Ghosts N’ Goblins clone, (Super Ghouls N’ Ghosts to be specific), That is quickly proven not to be the case, as a fellow warrior sends you into town. Once in the town you begin to do things that are more akin to an Adventure or JRPG. You have to talk to townspeople, whom give you vague clues, or demand you go on fetch quests. You eventually find your way to the castle where key members will send you on the adventure. The castle is also home to two major spots. A toy room, and another room that becomes important much later. Over the course of the game you’ll find dolls of low-level enemies, major characters, and bosses. Collecting every one of these gets you the best possible outcome, so its something you just might want to invest in. The other room becomes important later in the storyline, and involves warping you around to various areas. The game’s many stages are interconnected though not as intricately as something like Metroid. Be that as it may, you’ll still want to map it out, because you’re going to spend a large part of the campaign going sector to sector on foot. Why? Well remember the villagers I mentioned before? Many of the fetch quests they send you upon involve finding, and rescuing their friends from zombies. Aside from that there are also ghosts that can lead you to other secrets. And there are many hidden paths, shortcuts, and items that you’ll have to destroy parts of environments to even find. Basically, if you want to get the best possible finish you’ll need to do a lot of rescuing, and a lot of discovering. The rewards for many (but not nearly all) of these feats are the aforementioned dolls. Each of these dolls gets you one step closer to unlocking the door in the toy room, and the resulting end game. Not only that, but the only way to open up the game’s shop to buy power ups is tied to one of these fetch quests. Many of the villagers throughout the game want you to find one of the items they’ve foolishly lost. Each of the game’s areas has a village of their own, and many of their citizens lost these items in other areas. So you’ll be warping around a lot too. Throughout it all though, the game has that classic Capcom arcade game play down to a science. Well mostly. The majority of the time you’ll feel like you’re playing the unofficial sequel to Super Ghouls N’ Ghosts. Zombies rise from the Earth in much the same way. There are all sorts of monsters, and demons that show up out of nowhere, and you’ll have to master your jumping, and shooting pretty quickly. Where things falter a bit is in the hit detection. Unfortunately, there will be a few times where you’ll have your foot stand near, but not on a hazard. But the game will say “Nope. You touched it.” which leads to a cheap death. Other times you’ll suffer cheap deaths when enemies spawn on you, or shoot a projectile that gets stuck in a part of the environment. Thus making hitting it unavoidable. These aren’t heavily widespread moments, but it can be enough to get frustrating. In the case of the story mode, this is mitigated by having pretty decent checkpoints, you’ll automatically start in when you run out of lives. When you die, you’ll start right where you died too, so at least you won’t have to start an entire section over. Eventually you’ll find your way to boss rooms. Throughout the game you’ll need to find keys to the boss rooms, so again, keep exploring. Boss fights are quite frankly the highlight of the game. All of them can hang with the best fights in some of the best Super NES, and Sega Genesis games of yesteryear. They’re very inventive. Even when one of them might seem generic, like the Spider bosses, or the Skeleton, they do things that throw that impression out the window. Either through the environments they take place in, or through their attack patterns, or even character mannerisms. When you defeat a boss, and move to the next area you’ll almost always find yourself near a town, and in that town you’ll find a fast travel artifact. Late in the game you’ll need to collect items to be reassembled in that second room I mentioned earlier. Here you’ll feel like you’ve reached the end. But you’re still far from it. It opens up all new areas that can only be accessed in the room, and you’ll also find your dog’s soul will now become even more useful. 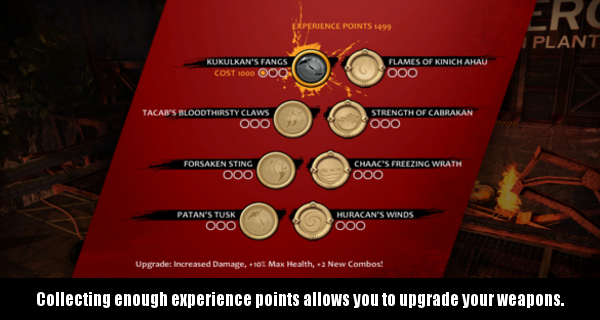 Over the course of the game you’ll acquire the expected knives, spears, lances, and such. All of which you can cycle through using the left shoulder button. But you’ll also start finding puppy soul powers you can use. These can help immensely, especially on bosses. Do keep in mind however, that these have limited supplies shared with your lives. So you’ll want to save these for key moments. Upon beating the story mode, you’ll find you won’t be done. You can go back, and find all of the dolls you missed. But beyond that you can play the Arcade mode. This mode is very much a Ghosts N’ Goblins experience with stages feeling more linear, and with the brutal challenge fans of that series would expect. You’ll have to start a stage over when you’re out of lives. Lives are really tied to Fritzy’s meter more so here, as when it becomes depleted completely you know you’re going to start the level over. Thankfully, you’ll still start where you last died. At least until the meter is depleted. You also get to use Fritzy’s powers in this mode as you find them by holding the attack button until it’s charged. Keep in mind as in the Story mode this will deplete the meter, so it reduces the number of lives you can use. Over time you can refill the meter the better you do. Getting to the end is a lot more streamlined as a result. Stages don’t feel exactly the same, as large chunks are completely different. Though you’ll still go up against the same bosses. Be that as it may, it’s still quite a tough game that will take all but the most devoted players a while to get through. Mostly due to the overall challenge of it. But some of the problems from the Story mode do rear their head here. So while the stages are shorter, and in a specific order, they add their own challenges, and sometimes the technical issues can make them even tougher. You can basically keep continuing, but each time means you’ll start the current stage over again, through all of its phases. The most striking thing about the game is just how good it looks, and sounds. This game is a wonderful send up of Super Ghouls N’ Ghosts. It has an amazing portfolio of sprite graphics, and animation that look like it could have appeared on Nintendo’s 16-bit juggernaut or even Commodore’s Amiga line of computers. The game even has a soundtrack that will evoke memories of the Commodore Amiga, early MS-DOS Adlib sound, and even a dash of the Sega Genesis for good measure. But even beyond that, you can have a more modern, CD quality orchestrated soundtrack if you choose. The game also has an optional scan line filter if you prefer a slightly blurred look to everything rather than have everything looking crisp. Still, on the whole it’s hard not to recommend this one. There may be some inconsistency in the FMV sequences, and the rest of the graphics. 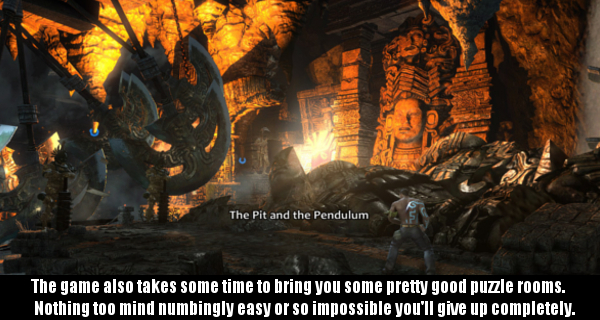 There may be some hit detection issues, and you’ll suffer a few cheap deaths here or there. But when the game is at its best it works so well it just has to be experienced. With two primary modes to play, it’s almost like having two games in one. Of course the main attraction is the Story mode. The variety of missions, and side quests while similar, will appeal to a lot of people who might normally skip it out of fears of the high difficulty, as it is a bit more forgiving. Be that as it may, the Arcade mode is something any fan of Capcom’s classic arcade game might want to play. The combat, while not perfect, is noticeably better than many of its peers. If not for the handful of technical issues you’ll likely run into, this would be a must own. But just because it falls a few notches away from perfection doesn’t mean it shouldn’t be played. It is true that it can feel, cheap, relentless, and unfair at times. But it’s also a lot of fun the other 90% of the time, with its solid action, loveable characters, and the fact it makes you want to spite it by beating it. It isn’t going to be for everyone. But for fans of adventure games with an old school twist, or Ghosts N’ Goblins fans yearning for the day when Capcom will finally take their money, it’s worth recommending. If this sounds like you Battle Princess Madelyn is still worth firing up on your computer, Xbox One, Switch, or PlayStation 4. Way back in 1984 came an excellent platform puzzle game called Boulder Dash. It was a big hit on home computers of the time. The Atari 400/800 version came first, but the game made its way to the Commodore 64, ZX Spectrum, and some of the consoles like the Colecovision. There was even an NES port. Over the years it has seen newer versions. Some by First Star Software, the company who created it. Others by different developers who were licensed to do so. PROS: A really great take on Boulder Dash with some refinements. CONS: Some of the tweaks aren’t intuitive. ROBOTS: Your quasi-human miners have been replaced by automatons. In 2012, a small outfit called Catnip made a new version for the Xbox Live service, and computers called Boulder Dash XL. It replaced the main characters with robot interpretations, but it retained the spirit of the original game fairly well. It also added a few new spins on the game which I’ll get to in a bit. Boulder Dash XL 3D is a port of that game to the 3DS. This port was done by the folks at Ludosity who went on to make the well received Princess Remedy games on Steam. For the uninitiated, Boulder Dash is a series where you collect diamonds while mining. You’re given a few minutes to get a certain number of diamonds, and then make your way to the exit. You do this, by moving around the stages, digging dirt, and picking them up. The challenge of course is trying to get these without getting crushed. Much like the rocks in Dig Dug, digging out the dirt from beneath the boulders will cause them to fall. You can also be crushed by the very diamonds you collect. But where Dig Dug focused more on defeating all of the bad guys in the stage to advance, Boulder Dash does a lot more with the boulders (hence the name.). Boulders, and diamonds will shift to the left or the right as they fall on top of one another. When you first start out, the earliest levels are pretty easy to figure out. You’ll find you can get the required number of diamonds, and get to the exit. There’s a bit of risk/reward too in that you can also try to get all of the diamonds for bonus points rather than just the required number to exit. Of course, getting all of the diamonds requires nearly flawless puzzle solving skills. Often times making a mistake will not only keep you from getting that last diamond, but may get you trapped between boulders, forcing you to restart. But its a very engrossing formula, and this version adds a host of new mechanics to an already fun game. There are transporters, there are boxes that turn boulders into diamonds, and vice versa. They even added a few power ups on some levels that are used in a number of puzzles. That’s in addition to some of the newer takes on enemy types featured here. There is a large wealth of content here too. There are around 100 stages or more for you to play through. This edition also has several modes in it. 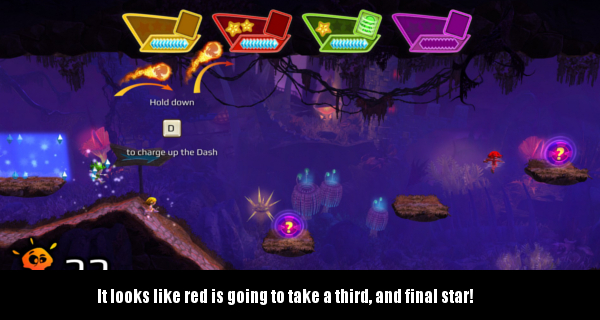 The primary mode is the Arcade mode, where the game puts you through the 100 stages in a row. This mode works with the traditional Boulder Dash rules. You’re given a time limit, and you have to get the qualifying number of diamonds to make the exit appear so you can escape as quickly as possible for the most time points. Again, getting every diamond is worth a huge bonus, but you risk running out of time, or trapping yourself if you don’t get them just right. Next up is Puzzle mode, which gives you a 25 stage gauntlet. Every stage you complete can be replayed at any time, but you’ll have to beat them all in a row in order to see them all. This mode eschews the time limit, giving you more time to experiment, and figure out exactly how the level designers wanted you to find your way out of the mazes. Zen mode is essentially the Arcade mode but without the time limit. So in a way it feels like a giant practice mode where you can try to fine tune your techniques on each of the stages to minimize the amount of time it takes you to clear them. It’s pretty neat from that particular perspective, but most will likely prefer the Arcade mode over it since it’s a lot more high stakes, which feels more rewarding when you succeed. Score mode features four stages where you can either try to go for the time bonus or you can try to get every last diamond possible. To get the best scores, you’ll likely have to skip a number of diamonds as it’s a balance of knowing how many diamonds, and how many seconds left on the clock will get you in terms of points. It’s an interesting concept some players may enjoy. To me it isn’t as interesting as the Puzzle mode, or as fun as the Arcade mode. But still fun to check out. Retro mode is one of the coolest inclusions in this game. It’s a combination of stages from the original game, as well as all new stages specific to this iteration. The interesting thing it does is replace all of the textures with the original 8-bit tile sprites from the Commodore 64 version of the first Boulder Dash. There are 25 stages in this set, and for older people like me who pick this up, the nostalgia it conjures up is great. But for people who never played the original, the newer stages are still a nice challenge. So even if you pick this up having never played the original, this mode gives you more content to enjoy. Visually, the main game on display here is pretty nice. The blocks, boulders, and diamonds all look pretty good, and the monsters all have pretty interesting takes on their original designs. There’s also a pretty good use of lighting considering the obviously smaller budget when compared to a lot of the big hits on the 3DS. Be that as it may, the change from the humanoid miners to robots is a bit weird. It by no means hampers the game. It isn’t going to make any old timers scream “Sacrilege!” to the heavens. It’s just a small change that doesn’t make any sense. As for the 3D, I couldn’t really test that out, as I own a 2DS which doesn’t have the 3D functionality. But honestly this isn’t the kind of game that requires 3D to enjoy. In terms of performance, I didn’t run into any major issues, though there was some minor slowdown when I caused a slew of boulders to fall at once. Still, it didn’t get in the way of the actual game play. There isn’t much in the way of good audio here though. The soundtrack doesn’t have the up tempo, frazzled chip tune theme of the original. It has a mostly forgettable set list, with one or two songs that can even annoy a bit. Some of you may disagree, but honestly I think you’ll enjoy it more without the music playing. The sound effects themselves are fine. You can hear the falling boulders, and explosions perfectly well, and they fit the game as intended. Boulder Dash is one classic game that is perfectly suited to a portable platform. It’s the kind of game you can attempt to clear a map or two in during a lunch break, or commute. But you can also spend a weekend away, putting in a few hours into going for a high score, or solving puzzles. It’s also just a great game in its own right. This version on the 3DS is a pretty fun, and convenient iteration of the game. It’s probably not going to live up to the lofty heights of the original versions for those who grew up with them. But be that as it may this is (as Metal Jesus Rocks might say) a hidden gem in the 3DS library. It’s addictive. It’s fun. It’s Boulder Dash. Released in 2012, Choplifter HD is another modern update of a classic game. But is this something you should download to your trusty computer, Xbox 360 or PS3? Or should you go back, and free your Apple II from storage? REALLY? : Scoop Sanderson? You couldn’t create a better Anderson Cooper parody? In 1982 Dan Gorlin coded what would be a classic computer game. Choplifter was published by Broderbund Software. First on the Apple II, and was then ported to other 8-bit computer platforms like the Commodore 64, and Atari 800. It proved so popular that eventually Sega would pay Broderbund for the rights to port it to arcades, where it became even more popular. Choplifter exploded onto 8-bit consoles after that, including the Atari 7800, Nintendo Entertainment System, and Sega’s Master System. But in order to fully explain the good, and bad about today’s game I have to first talk about what made the original so great. Choplifter was novel at the time because it wasn’t the typical arcade blaster most games of its ilk were. True, you did shoot down infantry, bomb tanks, and avoided being shot down. But most important was the fact that you had to rescue prisoners of war. In the game you flew out of your base over a side scrolling battlefield much in the same vein as Midway’s Defender. The difference being that you had to land over prison camps, and wait for the prisoners to board your helicopter, then hightail it to the beginning of the level to drop them off before heading out to get more. With every trip, the enemies became more relentless. They would employ more, and more manpower to stop you. Every wave graded you on how many prisoners you could rescue. The more lives you saved, the higher your score. Choplifter was also notable because of how you controlled your helicopter. You could have a left profile to fire at left targets, a right profile to go to the right targets, or face the foreground to attack foreground targets. By the time it hit arcades the game also had a fuel meter which added a little more strategy because it forced players to estimate if they could risk getting more prisoners or if they would have to go back for them later. So here we are 30+ years later with Choplifter HD, a remake available through digital distribution channels like Steam, and it’s still on PSN for PlayStation 3, as well as XBL for Xbox 360. How does it stack up? Well for the most part it plays pretty much exactly the same as the original game, and its variants. Most of the game will have you looking out for prisoners to pick up, and bring back to base. It also carries over the fuel system from Sega’s revised arcade port. As a result, Choplifter will really feel to familiar to anyone who grew up playing the original game. But by today’s standards some may feel the formula could become monotonous after a while. This is where developer inXile really took me by surprise. This new version adds a few new mission types to the mix. In some stages you will be tasked to instead take out certain targets rather than save people. In others you will have to prioritize saving injured prisoners on death’s door over other prisoners. Still in other missions you will merely have to get from one side of a map to the other without getting shot down. 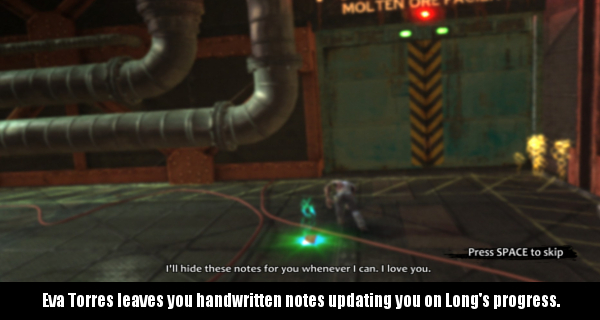 To keep things fresh they also added a few hidden secrets, and objectives. The most common one being the rescue of ever annoying news anchor Scoop Sanderson. Making a name only a few letters away from the real person is both hilarious, and pretty stupid. But to be fair, the characters do have some funny one liners even if they are repeated fairly often. For the truly devoted, there are also loads of video game cameos to be found here. Not the least of which involve Super Meat Boy, Duke Nukem, and Minecraft. As in the original, expect later levels to be very difficult even on easier difficulty settings. The game begins to really throw everything including the kitchen sink at you. Tanks, Fighter planes, EMP bombs, Snipers who have pin point accuracy, and hordes of zombies (Yes they even made a few George Romero stages for you) all come gunning for your chopper. Another cool feature of this remake is the fact that you can unlock more powerful or more interesting helicopters to replay earlier stages with. Some will make some levels easier, others will make them more challenging. It isn’t much, but it does give players a reason to go back, and revisit it. Of course, like many games these days you can pony up real world money to buy DLC. Namely more choppers. You really don’t need to do this, as the DLC doesn’t make the core game feel any more or less complete. 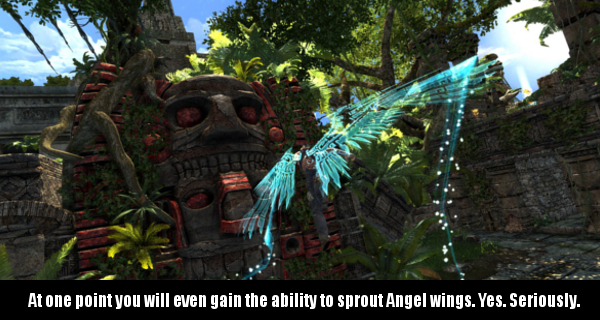 There are also a host of achievements players can go after if they are really dedicated to do so. Plus, the game doesn’t go on forever like other updates of classic games sometimes do. There are just enough stages to get your fill without it getting too old too soon. Visually the game is far from ugly, but it’s also nothing special. Characters are low poly count, and low detailed. Textures are fairly crisp, but also not overtly detailed. There are some mild lighting effects but again nothing that will wow you. But if you look a little closer you will find some details to appreciate. Shooting infantry will result in some 80’s action film cliché’s like oversold falls, or giblet showers, or in some cases flailing around while they burn to death. Explosions look the part, and the sound effects are mostly pretty good. As I mentioned before some of the dialogue is pretty funny. But the main voice of your helicopter pilot can grate at times. It also becomes obvious through longer play sessions that they have the same actor doing several parts. But in the end it’s a pretty minor quibble for a game like this. Choplifter HD is one of those fun diversionary games that is perfect for the digital download environment. It’s something you can play in short bursts, or for hours on end. It’s inexpensive so you really aren’t out a lot if you don’t enjoy it. But for those who do there is a lot to like. It’s too bad the graphics couldn’t have been just a tiny bit better because at first glance they may remind you of some of those cheap shovelware games you find in supermarket discount bins during the holidays. That’s not to say graphics make a game good. But in a case like this with a game with little fanfare, the casual observer may make the mistake of passing it up. Even for an equally priced download that truly is shovelware in sheep’s clothing. Honestly there are far worse things you can spend money on than Choplifter HD. If you’re even the slightest bit curious about it do give the game an honest shot. It’s a fun update of a vintage game. It doesn’t try to reinvent the wheel, nor does it do too little. It isn’t the prettiest update around, but it is a pretty fun break from everything else. Final Score: 7 out of 10. Black Forest Games gives us a bite-sized Giana Sisters based off of a recently added multiplayer mode for Giana Sisters Twisted Dreams. Is this another underground classic for this underground series? PROS: This game is a lot of fun. CONS: But only if you have friends to play it with. It’s no secret that I like The Great Giana Sisters. First taking Super Mario Bros style platforming to the Commodore 64, and other home computers throughout Europe. Then decades later on the Nintendo DS in a sequel. Then it took an entirely different direction in its third installment Twisted Dreams, and its expansion Rise Of The Owlverlord. After these titles, Black Forest Games moved onto its current Early Access project Dieselstormers. But every so often it has given its core Giana fans something to sate them. For awhile they were free bonus levels, and recently a Multiplayer mode for Twisted Dreams. 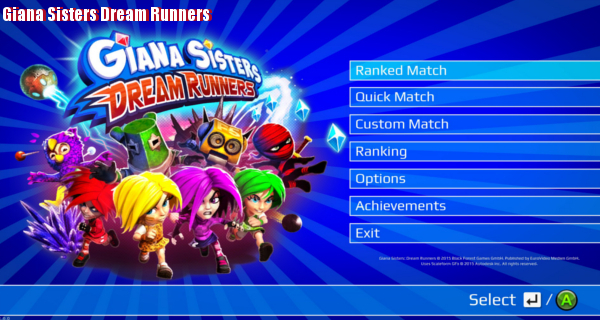 Giana Sisters Dream Runners is a standalone multiplayer only game based on the earlier Twisted Dreams multiplayer. In this game you are given a decent number of levels that can be played with up to four players. You can do this online or offline. The object is less like a traditional platformer, and more a Kart racer. But don’t go into this expecting something like Wacky Wheels. These are still 2.5D environments you’ll side scroll through. Racers have to run through the courses for several laps. There are power ups you can gain, similar to Mario Kart. You can use these to slow down or take out other racers temporarily, giving you the chance to outrun them. There are a fairly wide variety of these items. One spawns three owls to attack other players. There’s a spring that shoots mines at everybody. Another one targets each player with lasers. There’s even a homing meteor! Not every item is a weapon. Some give you a quick warp a few meters ahead, or a more powerful roll attack to get through some of the enemies or traps easier. The game also adds a dash mechanic where pressing down lets your character do a baseball slide under low hanging traps. You’ll want to master this. If you can manage to outrun everyone else the person you’ll get a star. The first player to get three stars wins the race, and you’ll go back to the race selection screen to pick a new stage to race on. The way you outrun the other players is a bit systematic. Eventually the furthest behind will fall so far behind they go off-screen. When this happens, a thirty-second time limit lets the remaining three players know they’re going to have to dig in for the top spot. When the timer runs out the person currently in first gets that precious star. It should also be noted, that the Twisted Dreams button layout doesn’t translate to Dream Runners. That’s because not only do you now have a weapon button, but the light/dark mechanic has changed. It is still here, but instead of changing on the fly, there are now floating spheres you touch in the courses to make that happen. It adds a strategy in that it can change sections of the track, giving players another avenue to confound, or elude the competition. 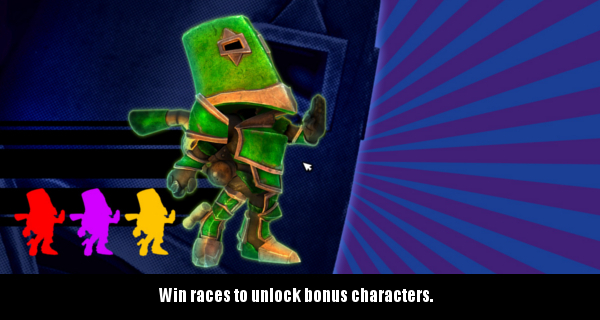 Over time you’ll unlock additional Giana Sisters characters including some of the series’ notable enemies. Each character has some advantages or disadvantages, but all seem fairly balanced. It’s a pretty cool game that combines kart racing mechanisms with speed running. On its face, the game is exceptional, and gives you everything it advertises. But I’d be remiss if I didn’t tell you there are a couple of big problems with Giana Sisters Dream Runners. The biggest problem is the fact that you cannot play this game with less than two players. Well actually you can. But you won’t want to for very long. There are bots you can put in, you can even assign three of the four players as bots. The bots can be challenging, but since every round is a single race, rather than a circuit there isn’t much incentive. On the plus side, you can give each bot its own difficulty, but ultimately nothing beats the fun of trash talking your friends in a racer. This is really the sort of game where you want to play with at least one other person. Playing with three people is the most ideal though since there is a lot more back, and forth near the top. The final problem is the game’s online mode. Net code, and stability seem fine. The problem isn’t so much with running into lag, rubber-banding or warp despite a low ping. No, it’s the lack of players. You might wait a while for an opponent to show up in your lobby. For whatever reason, many of the people who own this one, aren’t playing online. At least not as I write this. 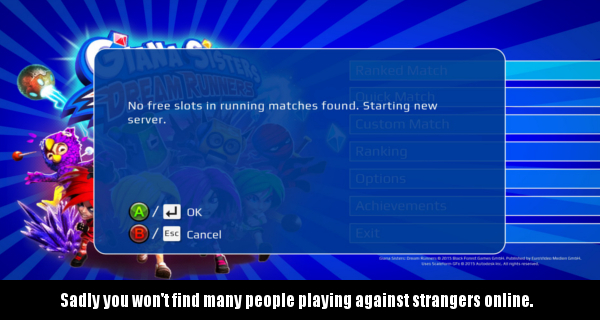 Again though, if you have a few friends with a copy, Online mode can be just as enjoyable as playing locally. In spite of these issues though, I’m not going to tell people to skip this game entirely. The underlying game is wonderful. It gives speed runners the challenge of making it through a difficult course, and gives kart racing fans the items, and mind games they love. If you loved the soundtrack in the last game, and its expansion, you’ll enjoy it here too. Some old songs return, with some crafty remixes of others. Giana Sisters Dream Runners is a really good game. It’s just saddled with some baggage that will unfortunately hurt single players. If you have a group of friends who are willing to play something different with you however, pick up a few licenses, and have at it. Especially if you enjoyed any of the other games in the series. It’s almost guaranteed that if you come up with something wonderful, many will try to copy it, or improve upon it. Sometimes this leads to some really heated, and awesome competition. Other times, we see a laughable attempt at coat-tail surfing, and in the worst cases we end up with flat-out plagiarism. Today’s game really leans toward the former. It takes the base functionality of a modern classic, but changes nearly everything else. It even takes a few of its own chances. It results in something you’ll really want to check out even though it won’t become as memorable as the mold it was born from. PROS: Controls. Tongue in cheek humour. Variety. Fun! CONS: Low rent graphics in spots. WAIT WHAT? : The conversations Marlow has with a mask. Marlow Briggs, And The Mask Of Death is very much indeed; a God Of War clone. Like the Sony flagship spectacle fighter you go through hacking up thousands of enemies. 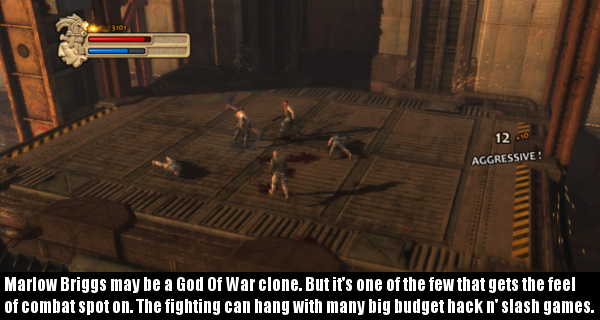 There are various weapons wholly inspired by those of Kratos. The dual blades are here, the chain whip is here. Even some of the magic spells of doom are here. But that’s really where the similarities end. Because the other 85% of Marlow Briggs is a late 80’s direct to video action film. 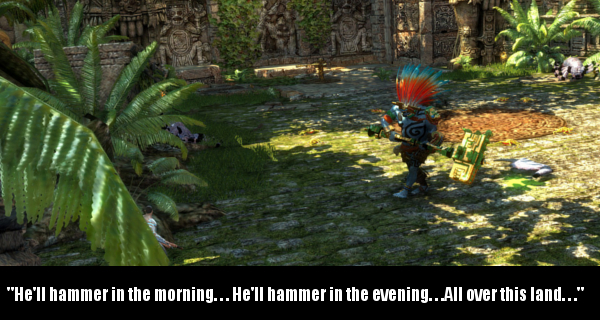 Things kick off briskly, as Marlow Briggs meets up with his girlfriend, Eva Torres in a South American jungle. She works for a business doing research on ancient codex wheels, and artifacts. When she feels uneasy about continuing to do translation work for Heng Long, she tries to quit. 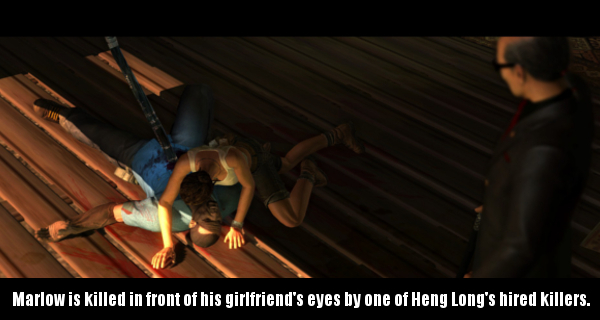 This only serves to enrage her boss who has Marlow Briggs killed on the spot. His girlfriend is then taken hostage, and forced to continue her work. Why? Because her evil employer wants to uncover the steps to an ancient ritual. What is the ritual? A means for him to become a dark godlike creature who can take over the world. 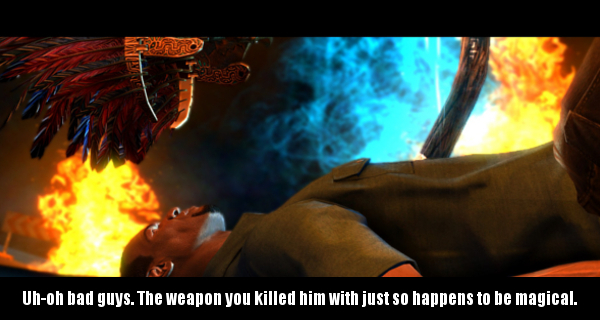 Fortunately for Marlow Briggs, it turns out that the weapon he was killed with was magical. It resurrects him as a super powered warrior. So like any direct to video action star, he sets out to free his girlfriend, kill the bad guy, and save the world. When I say direct to video action movie, I mean it too. 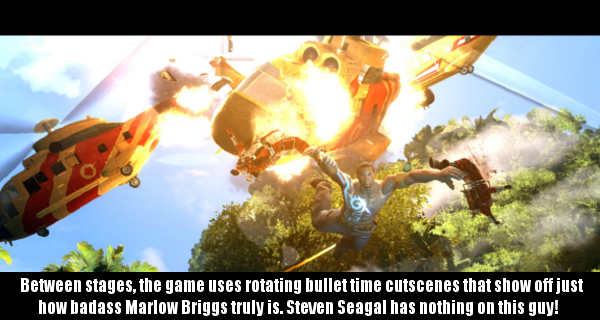 Marlow Briggs is a game that relishes the bit. It doesn’t hide from the cheesy story, or over the top action at all whatsoever. It lives, and breathes everything from Dolph Lundgren to Jean-Claude Van Damme, and never apologizes for it. It just expects you to go with it, and you will. 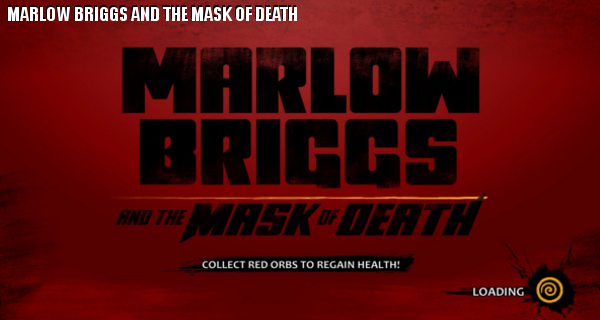 Because Marlow Briggs, And The Mask Of Death is fun. A lot of fun. Upon closer examination you may notice that the game is not a visual powerhouse. Characters are lower on the geometry, some of the textures are decidedly lower quality, and models lack some detail. But things also look good enough that it won’t bother you. There are some nice bloom effects, here, and there. And the game runs at a pretty smooth frame rate, with little to no hiccups along the way. It really isn’t going to matter to you anyway. Because the game is going to keep you busy with a lot of things going on. You won’t have much time to be counting the number of shadows on a minion’s costume because you’ll have to defeat him, and around ten of his buddies. Voice acting is full of the wooden dialogue, and cheese in DTV, and made for TV movies. But in the context of this game it is a very good thing. Everything comes together, and the game’s amazing score complements the action really, really well. It truly does feel like the most epic B-movie turned video game. Unlike most clones of God Of War, Devil May Cry, or other popular hack, and slashers this game gets something right. The play control. Many smaller developers, and even some larger ones tend to make entries in the genre that never seem to get the feel just right. Either there are noticeable breaks in the action, or a combo will feel sluggish. Other times timing or hit detection will be bad, or just off enough to make for slow, plodding, and unfair moments. Marlow Briggs doesn’t fail here. Combos flow very nicely, with some smooth animations going along with them. Like the recent run of Batman games, there is a large enough enemy variety, and pizzaz during fights to make mashing X worthwhile. As in the games it cribs from, you can also upgrade your attack power, and spell power by collecting yellow orbs for point values. When these become high enough in number you can go into a pause menu to do this. Pausing the game will bring up a screen where you can spend your yellow orb experience points to perform your upgrades. Often times you will actually be directed to go into this screen the moment you have enough of them. Each weapon, and spell can be upgraded up to three levels. Doing this buffs the damage output in your attacks. You can also access a trainer from the pause menu. 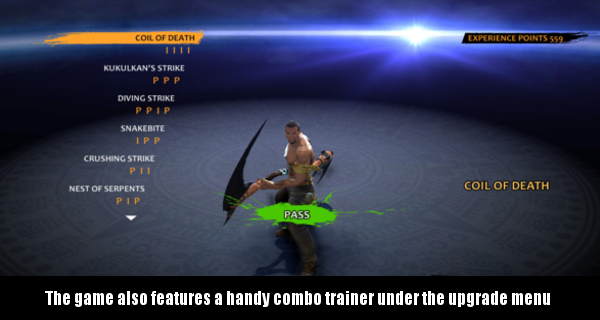 This lets you practice the various combos with each of the game’s weapons. 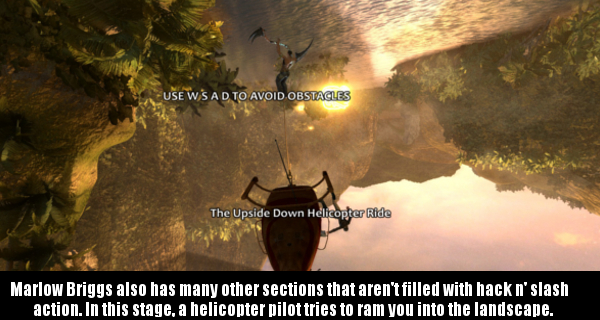 It isn’t something you need to really do if playing on a lower difficulty setting. But if you are playing on one of the harder settings you may want to learn some of them to keep the waves of bad guys from hitting you. As you go through the game, you will eventually stumble onto the various weapons, and spells by beating stages. Once you have them you can switch between them on the fly. The scythe is two ended, and is the first one you’ll receive. It does medium speed combos, and is the one that gets you started. The dual blades are a lot faster, and work great when you are being mobbed by waves of enemies. The chain whip is pretty cool, allowing you to get combos that do hundreds of hits. It doesn’t do as much damage, but it has an insane range. There is also a hammer which is slow, but has a fairly high damage output. In my experience I found the dual blades worked out the best, though other players may prefer one of the other weapons more. Spells include one that brings about meteor showers. One that brings about hurricanes, and tornadoes. Another one blasts the ground hard enough to pull up rock from underneath enemies. The last one does more with water, and ice. All of these can be upgraded, and they all do fairly large damage on the lowest grade enemies. Larger enemies seem to take different damage levels based on the spell. You can also possess certain enemies after you do enough damage which makes them either help you out as an NPC or turns them into a vehicle you can control. The latter is especially fun as you can control giant scorpions. Enemy variety is also impressive. You will fight everything from mercenaries, to bird people, to wizards, to killer beetles. The list goes on, and on. Using spells, and throwing knives also costs mana. This is measured by a blue bar on the HUD, while your health is measured by a red bar. There are red, and blue masks you can collect to refill these bars in the field. Game play is broken up between sections, and eventually becomes a formula countless games already use. First you will have a wave section where you have to beat down waves of enemies. Completing these sections will lead into some platforming areas where you will climb walls, swing from cables, jump from place to place, and so on. These are pretty fun, and challenging sections in their own right. Many times these areas will task you with some puzzle solving. Again, it isn’t something tossed in “Because game X happened to have it.” Most of the puzzles actually take some thought to work through. They tow the seemingly fine line between “Why bother if they’re going to be this easy?”, and “Why is this so impossible?”. There are also mini boss encounters, and boss encounters near the middle of stages, as well as at the end of stages. As in God Of War there are also some QTEs you will be tasked with. Thankfully, these aren’t over done in the game, used only during boss battles, or gaining entrance to certain areas. The game also attempts to keep things from devolving into monotony with a variety of time trial sections where you have to get from place to place as fast as possible, while avoiding traps or other dangers. It attempts to further mix things up with on rails sections. Some of them involve collecting orbs, as you slide down an obstacle course, while others are turret sections. The turret sections work more in line with games like Sin & Punishment or Star Fox. There are even two shoot ’em up stages near the third act that while not original, (Think 1942, Sky Shark, or Twin Cobra) are still pretty fun to play. These can also be played independently of the main game once you encounter them during your initial play through. Completing the game also reveals an end credits clone of Gravitar. Marlow Briggs is also not a very long game either. Which is actually more of a help than a hindrance. Many spectacle fighters, and beat ’em ups can go on far too long for games of their type. In spite of this there is still a surprisingly varied number of settings. Jungles, caverns, industrial foundries, even an icy mountain stage. A really good player can clear it in a few hours while the rest of us will probably do it in around 8. But what a fun 8 hours it will be. It has cheesy dialogue, one-dimensional villains, and a lot of over the top “Oh come on!” moments. It won’t wow you with its graphics. But it is a lot more fun than you might think it has any right to be. It is every definition of the phrase “Sleeper hit”, and one I highly recommend fans of hack and slash titles look into. Adventure platforming returns in Deadlight. PROS: Great visuals, gameplay, level design. CONS: You’ve seen this story dozens of times now. MAKE IT HARDER ON YOURSELF: Try to beat it without shooting any zombies. As a gamer during the holiday season sometimes friends, and family may scrape enough together to get you a game or two. One of the more interesting games I received for Christmas 2013 was Deadlight. Released at the tail end of 2012, Deadlight is a survival horror themed game that shares an awful lot more in common with games like Another World (Out of this world), Flashback, and the original Prince Of Persia than it does those like Resident Evil, Silent Hill, or Eternal Darkness. It’s almost jarring because the visuals in this game go out of their way to use the Unreal Engine to evoke that sense of dread seen in the last 15 years of survival horror. The storyline follows that of a gristly aging man named Randall Wayne who is searching for his family in the zombie apocalypse. It’s not the most original story in games or films especially in this current trend of zombie themed stories over the past several years. But to its credit, Deadlight does try to put its own spin on it toward the end. Throughout the campaign you guide Randall through Washington suburbs, cityscapes, underground caverns and more as he tries desperately to find his loved ones. The game is displayed, and played in a 2.5D perspective. As I said near the beginning of the review, Deadlight takes its inspiration from early 90’s platform adventures built around trial, and error puzzles. The most notable of which is Another World. So much so that when you beat the game, you can find Eric Chahi’s name in the special thanks section of the credits along with Jordan Mechner’s. These were the creators of Another World, and Prince Of Persia respectively. Like those games, Deadlight’s gameplay puts you into situations where you have to think about carefully timed jumps, plotted out uses of items, or causing distractions to solve puzzles. Most enemies have to be outwitted rather than dispatched save for a couple of epic sprinting sections that will bring back memories of escaping Combine forces near the beginning of Half-Life 2. Miss a jump, and you may fall onto spikes. Time a roll wrong, and you may find yourself electrocuted. Fail to solve a puzzle in time, and someone you care about may die causing a game over. There are also a lot of secret items, like diary pages, and scrapbook pieces you can collect to fill in some of the back story if you’re so inclined. If it sounds like I’m calling Deadlight too derivative, don’t take that the wrong way. It does indeed borrow a lot of elements from its inspiration, but by no means does this make it a bad game. In fact, it does a pretty great job in its attempts to recreate that style of gameplay that has been relatively absent since the days of the Amiga, Super NES, and Genesis. 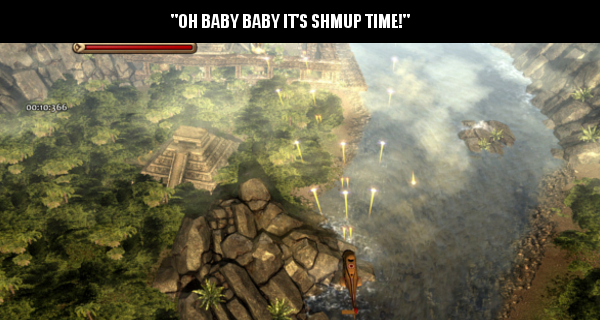 It’s clear that the folks at Tequila Works loved those games, and were really committed to making a great send up of that gameplay. Deadlight does make a few missteps along the way though. First of all, the PC version of the game has a very paltry configuration menu. If you play this game on a computer you will find one sole, slider devoted to quality. That’s it. Moving it left turns some of the effects off, while moving it right will turn some back on. You can’t turn on or off individual settings at all whatsoever. So those who really like to tweak games will be disappointed. Keyboard commands are there, but it’s clear that the game was meant to be played on the Xbox 360 pad. From the Microsoft game studios logo in the credits, to the 360 button prompts, to the references to Xbox Live, you will really want to play this on a 360 pad if you have one. Deadlight tells its story mostly through cinema screens that are animated in only one or two spots. I know this is a growing trend in middle budget, and independent games. But in the case of Deadlight it really misses an opportunity to try to ape its inspiration. One of the reasons Another World was so great was because of how it could tell its story so well without a single line of dialogue. 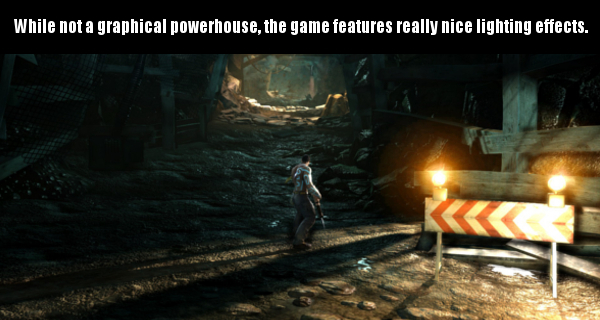 It used it’s environments, and players’ reactions to them to tell the story. Deadlight has some great environments, and to be fair most of its voice acting is pretty decent. But it doesn’t use them to their full potential. It would have been nice to see more of the cinema screens replaced by the in-game sequences the game already uses to further back story in some sections. Also I would have liked to have gotten to know the motivations behind the true villains revealed to the audience during gameplay. We are told that they are behind the zombies, and they have ulterior motives. But the game doesn’t really explore that back story very well. It does give us some insight into the past of the protagonist though, and so it does wrap up that narrative, even if it is a little abrupt in doing so. In the gameplay department, it isn’t always obvious which ledges can be navigated or what objects can be moved. But those are indeed nitpicks. After a few times of dying trying to solve puzzles you’ll have that idea bulb go off, and make your way out. Finally, the game isn’t very long. Advanced players can make their way through the game in about three hours. The average player will probably complete it in about five. The game is a budget priced title, so this isn’t as bad as a AAA $60 title clocking in at far too low a running time. But at $15 some players may decide to wait for a discount. Overall however, I really enjoyed my time with Deadlight. It isn’t going to be the most original title you’ll play. It’s story, and gameplay have been done elsewhere. But it is also a very well crafted game you can tell developers really poured a lot of effort into. The mechanics work great. The play control works great. The puzzles are put together very well. It’s just a really fun game to play through, and figure out. For anyone who wishes there were more Another World, Flashback, Prince Of Persia, or early Oddworld games to play, check it out.